Speculating the truth of the Bloody Mary urban legend. There are over a million different stories like The Bloody Mary Legend out there. EVERY small town all over the world seems to have its own version of it. The Legend, has a buttload of names that seem to be different everywhere you go. Bloody Mary and Mary Worth are the most common. Sometimes, it isn’t even Mary, but the Devil himself. Where I come from, in New Castle Pennsylvania, she was known as “Mary Black.” Kids would turn off all of the lights, look into the mirror, and say mean things like, “we have your children, Mary Black,” or something. Usually, all they succeeded in doing was getting themselves so scared that, they’d end up crapping themselves. Good thing they were already in the bathroom, huh? It’s been a long time since I’ve been to New Castle, but if memory serves me correctly, she was supposed to be a witch or something that was burnt at the stake after her children were taken from her. I really can’t remember. The point is, that it’s probably a different story than what you’ve been told, yet oddly familiar. Before I get into talking about who the REAL Bloody Mary was, or where she might have come from, I wanted to take the opportunity to tell you guys about our Bloody Mary Legend Archive. To the left, in the sidebar, you can see a bunch of locations, mostly the names of a bunch of states. That’s all of the different Bloody Mary Legends submitted to The Beyond by readers like yourself from all over the globe. If you’re interested in seeing all the different versions of the legend, you might wanna check it out. If you’re knowledgeable about the legend in YOUR hometown, please fill out our Submission Form. We’ll add your legend to the archive. Now, on to the meat and potatoes! I’ve done a little research, and unfortunately, it seems that the truth of the legend was lost over the years. That’s the problem with stories like this. Everyone adopted their own little spin on the story. Over time, as they pass from generation to generation, and from person to person, they become more and more exaggerated to the point that no one knows where falsehoods end and truth begins. We may never KNOW the truth. There are a few sites that explore her origins. I’m not going to take their stuff and rehash everything they’ve said, and most will tell you the same old crap about the thing. It all leads to the same stories that seem to make no sense, or the inclusion of Queen Mary Tudor. I’m not going to go into some super long and boring history lesson about Queen Mary Tudor. I mean, if you’re really THAT interested, you can look it up on sites that are dedicated to her personally. All I’m really interested in, for this site, is her connection to the ‘Mirror Witch’, Bloody Mary. 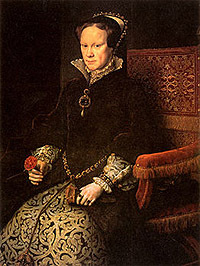 Queen Mary I of the Tudor dynasty ruled England and Scotland from 1553 to 1558. During that time, her biggest project was an attempt to reestablish Roman Catholicism in England which led to the name, “Bloody Mary”. Mary died at age 42. It is probable that she died of cancer, but it is not 100 percent certain. Many believe that it was actually ovarian cancer. She didn’t have a very long reign. It was only about 5 years. Her half-sister Queen Elizabeth I succeeded her, and reversed Mary’s efforts to reestablish Roman Catholicism in England. Why is she connected with the Bloody Mary legend? The Bloody Mary Legend: The Bloody Mary legend throughout the world has a very common theme of the ‘woman’ in the mirror and her children. People often use taunts regarding her children to summon her. “I have your children” and so forth. Queen Mary I: She never had any children. She tried many times, and had multiple miscarriages, or false pregnancies. It has been said that producing an heir was extremely important to her, but she could never make it happen. The Bloody Mary Legend: The name ‘Mary’ seems to be the REAL constant with most of the legends. Adding the word ‘Bloody’ to it seems to be an afterthought in many cases. Names like Mary Worth, or other variations are also used. There seems to be too many to count. Queen Mary I: This woman actually earned the name ‘Bloody Mary’ in her lifetime. She is known as the Queen that brought Roman Catholicism back to England. She had almost 300 Protestant dissenters burnt at the stake. The Bloody Mary Legend: There is very little room for doubt that mirrors or other reflective surfaces are an important aspect of The Bloody Mary Legend. Pretty much ALL variations of the legend incorporate them. Queen Mary I: Mirrors and Queen Mary Tudor, based on my own research have no connection to speak of. I have to say… At this point, I don’t think that Queen Mary I of England has ANYTHING to do with the Bloody Mary Legend that we’re talking about on this website. It just doesn’t make sense. The thing, whatever it is, that people are seeing in their mirrors, to me, based on what I’ve learned, doesn’t seem to have ANY real connection with the Queen, aside from the name. I DO believe that the name itself came from her. I think that the legend somehow got confused with the Queen Mary I history, and people over time merged BOTH stories into one. This is just my personal theory, and you all know I’m full of it, so pay no attention to me. Does the ritual really matter? The things that people say, and the rituals people use to conjure her change with each legend as well. In some of them you have to do the ritual at 3AM while spinning on your head, and eating a ham sandwich. Then, and ONLY then will she come through the mirror, and kick you in the nuts. Like I had stated before, the stories are different, yet the main points remain prevalent throughout almost all of the legends. A psycho woman, supposedly named Mary, comes through the mirror to do harm to someone who is chanting her name, or taunting her in some way. All legends seem to agree on that. I’ve heard a LOT of stories about odd things appearing in mirrors while someone was trying to conjure her, too many to count. And, believe me, they all didn’t have the same back story, and I’m sure the ritual they used to bring her forward was different as well. So the real question is, does it really matter what legend you’ve heard, and what ritual you use? Doesn’t look like it matters at all, which is an unsettling thought. If the ritual doesn’t matter, is it possible for something to pass through the mirror without any help from us? Is this idea REALLY far too removed from reality? It’s a common belief that mirrors can be used in other applications, divination for example. For years, people have used mirrors to ‘see the unseen’. It is called ‘scrying’. People look into the mirror, or other reflective surface. Hell, even still water can be used, and crystal balls are common for this practice. I’ve even heard of people using fire or dirt to scrye into, but I’ve never heard of people seeing Bloody Mary in a pile of dirt, so let’s stick to the reflective mediums. The user will stare into the reflective surface in a very low lit room. Maybe a candle or two will be lit, or the light will be dimmed. Some even do this in complete darkness. By staring long enough and focusing enough, you can reach a very comfortable trance-like state. It’s difficult to explain for those that have never done it. I think I know how to explain it. Think about one of those 3D art pictures that were a big fad in the 1990’s, a stereogram. You stare, and stare at these things until eventually you reach a state of focus where the hidden image, or pattern appears. The image directly below is one of those 3D images. If you don’t understand how to use them, it’s simple. 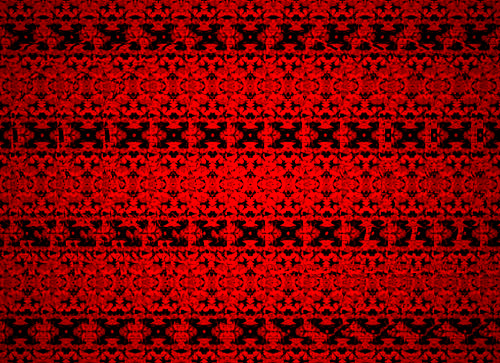 All you have to do is blur, and/or focus your eyes on the pattern in the image. Eventually you’ll reach a point where the image will appear. It’s that simple. Now while you’re in the state of focus that you can actually see the image, you may notice that it’s a very weird feeling. It’s almost a cross between dizzy or sleepy, and everything in between. While scrying into a mirror, or crystal ball, you reach a state of focus that I would describe as being very similar to the focus needed for the 3D image. The difference is that with the 3D image, your eyes and maybe even your head will begin to hurt after a while of doing it. They feel strained. With scrying, I don’t remember it ever being uncomfortable in that area. As a matter of fact, if I’m not mistaken, it’s a very relaxing experience. Those of you that are into scrying, If you feel I’ve explained this inaccurately, PLEASE drop me a line and let me know, as I plan to eventually do a whole page on the subject. But, back to the matter at hand. I hope I have explained it enough for those of you that were not previously introduced to it. But why? What’s the point of scrying? People have been scrying for thousands of years for divination. Divination is just a fancy word for ‘fortune telling’. That sounds a bit condescending, so I’ll say that it’s a lot deeper than just fortune telling, but I’m not gonna EXPLAIN ‘deeper’ because this page isn’t about that. Maybe later, as I’ve said, I’ll give it its OWN page. But for now… People use scrying to ‘divine’ knowledge that cannot be obtained by scientific means. Where does this ‘divined knowledge’ come from? If you believe that divination is possible by using a mirror, the next logical conclusion would be that there’s something about a mirror that either amplifys ones own abilities, or possesses some of its own, conceivably both. It is widely believed that everyone on the planet has a third eye, or sixth sense, or whatever you want to call it. WE have abilities that most of us have not yet figured out how to unlock. So, to answer the question, “Where does this ‘divined knowledge’ come from?”, I’d have to answer that in many cases, the knowledge or information comes from US. The ‘scrying’ is only a tool to bring that part of us out. Now, I said that ‘in MANY cases’ this stuff comes from us. There is also the train of thought that while scrying, you open yourself up to other energies, and become ‘open’ to receive information from outward influences. Many believe that a mirror is a portal to another place, possibly the ‘other side’ where spirits of the dead, or even spirits that were never alive reside freely. 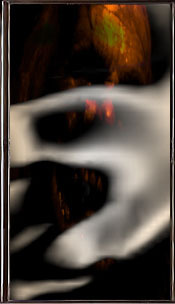 If this is true, then ‘opening yourself up’ through scrying would logically enable these spirits to show you things, and give you the information you seek… Or they can show you things that you had never intended to see, things that you wish you hadn’t seen. What’s in there? What’s on the other side of that portal? Something has to be there, right? Too many people have reported seeing something. Is it possible for them to all be wrong?